Emmeloord/The Hague, 1 March 2016. The construction of the 48 wind turbines for the Westermeerwind Wind Farm in the IJsselmeer is complete. Siemens has finished installing the final turbine. The wind farm will commence operations following the test phase. The very windy location and the quality of the selected turbines will ensure high sustainable electricity production, as is already clear. Anne de Groot, Director of Westermeerwind: “Since almost half of the wind turbines were transferred to Westermeerwind in February, the wind farm already generates sufficient green electricity for almost 80,000 households. At this time Westermeerwind Wind Farm is the largest wind farm in the Netherlands. During the coming period the other half of the wind farm will be extensively tested and upon completion main contractor Siemens will also transfer the last turbines to us. The total 48 turbines will then generate sufficient wind energy for some 160,000 households. About one year after the wind farm is operational the residents and farmers in the Noordoostpolder, Urk and the former Lemsterland will be able to participate by means of bonds or shares”. “It took one year to install the foundations, cables and turbines for the Westermeerwind Wind Farm, as planned”, says Willie Wienholts, Project Manager at Siemens. 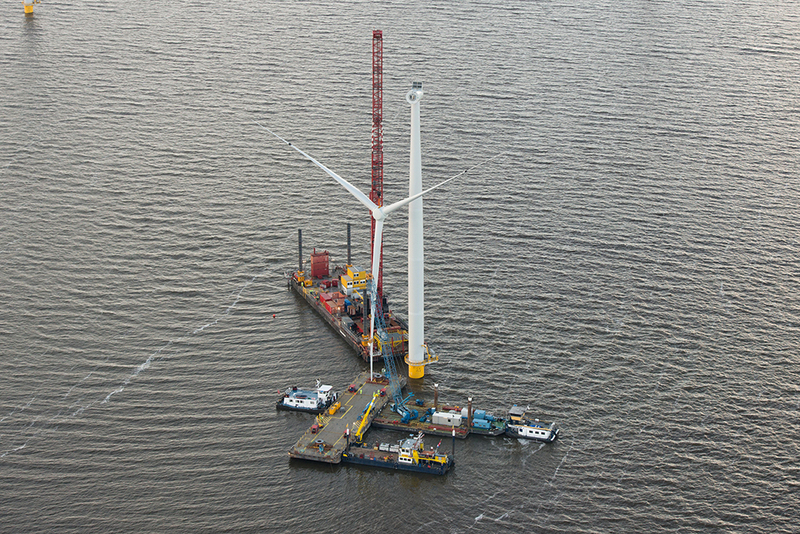 “The first foundation pile was driven into the bottom of the IJsselmeer in March last year, and the last pile in May. During the summer months the electricity cables were laid and the transformer station on land was completed. Siemens installed the first complete wind turbine in September on its foundations and now, six months later, the final one. Siemens will also maintain the wind farm during the coming 15 years”. Siemens has installed the last of the total 48 turbines for the Westermeerwind Wind Farm (@Westermeerwind). Westermeerwind has outsourced the site supervision and the project management of the Westermeerwind Wind Farm to Ventolines in Emmeloord. Siemens is building the Westermeerwind Wind Farm as the main contractor and will maintain the wind farm for a minimum period of fifteen years. Various Dutch companies are working as sub-contractors on the project, including Van Oord and Mammoet for the foundations and the installation of the wind turbines and VBMS (VolkerWessels Boskalis Marine Solutions) for the cabling to the transformer station. The electricity is bought by Eneco.